When my husband and I were planning our recent road trip, we realized that our drive home from St. Louis could naturally follow the same trajectory as old Route 66. Even though our trip west wouldn’t begin in Chicago (the traditional starting point) and our final destination wasn’t Santa Monica (Route 66’s “end of the trail”), we were excited to have the opportunity to see many of the famed byways and unique roadside attractions we had heard so much about. Chain of Rocks Bridge in St. Louis, MO. Where our journey west began. Like many of the original highways constructed in the early 1920s, Route 66 was designed to connect urban and rural communities and break the monopoly of the railroads. Nicknamed “America’s Main Street” and the “Mother Road,” it linked hundreds of small towns along a winding 2,400-mile ribbon of asphalt. Although the highway was used during the Dust Bowl and the Depression by those who traveled west seeking better lives, it wasn’t until the late 1940s and early 1950s that Route 66 fully became a symbol of freedom and the wide open road. With the economic boom of the post-war area, more Americans had money to buy cars and the leisure time to travel, and a road trip on Route 66 was almost a rite of passage for many. That began to change in 1956, as the Interstate Highway System started to develop super highways that were straight-lined and designed to move people from one place to another as quickly as possible. Because the modern highways bypassed hundreds of the small towns along the path of Route 66, many couldn’t survive. Just like the cracked and crumbling asphalt, the towns and the business that depended on travelers began to decline. 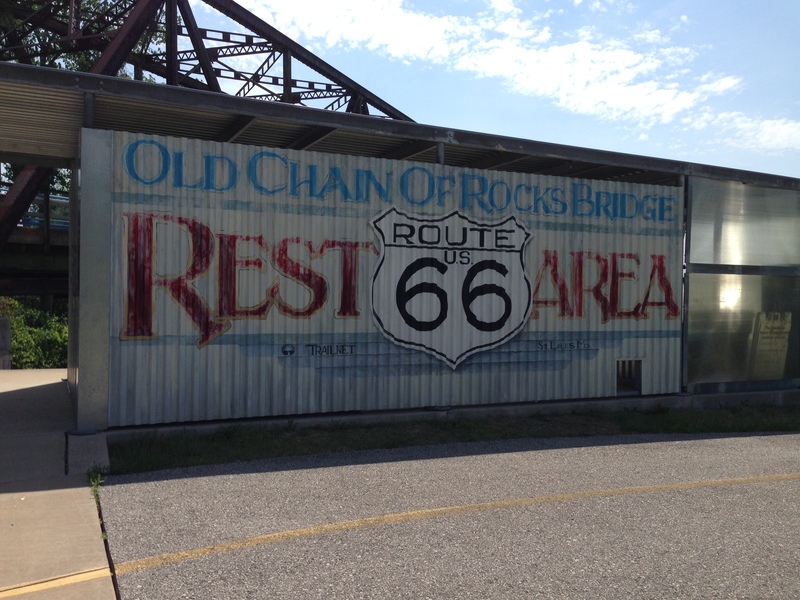 In 1985, Route 66 was officially decommissioned by the federal government. 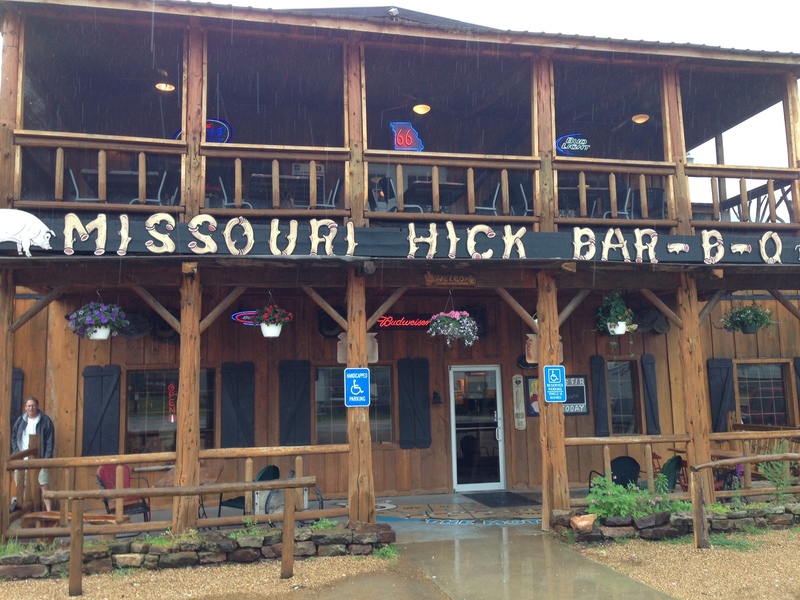 Missouri Hick Bar-B-Q in Cuba, Mo. Very different from the Cuba we visited in January. As we made our way west, we ran into a lot of fellow travelers who were also tracing the historic route. Some were dedicated Route 66 explorers and others, like us, made stops here and there at towns and attractions that sparked an interest. We were surprised to discover many Route 66 aficionados were visiting from other countries, including a group from Sweden traveling on rented motorcycles. Just about all of us were baby boomers. World’s largest rocking chair in Fanning, Mo. Many of the shopkeepers and restaurant owners we talked to along the way shared that business wasn’t what it used to be. Several pointed to the recent recession as the beginning of the downward trend and I’m sure that had a big influence. But, I also wonder if the lure of America’s Main Street just doesn’t tug at the imagination of Gen Xers and Millennials as it does for Baby Boomers*. Yes, there are various Route 66 associations and preservation groups, but most members are over 50. Back in 1999, our former Boomer-in-Chief, Bill Clinton, signed a National Route 66 Preservation Bill. I’m not sure a similar bill could pass today. 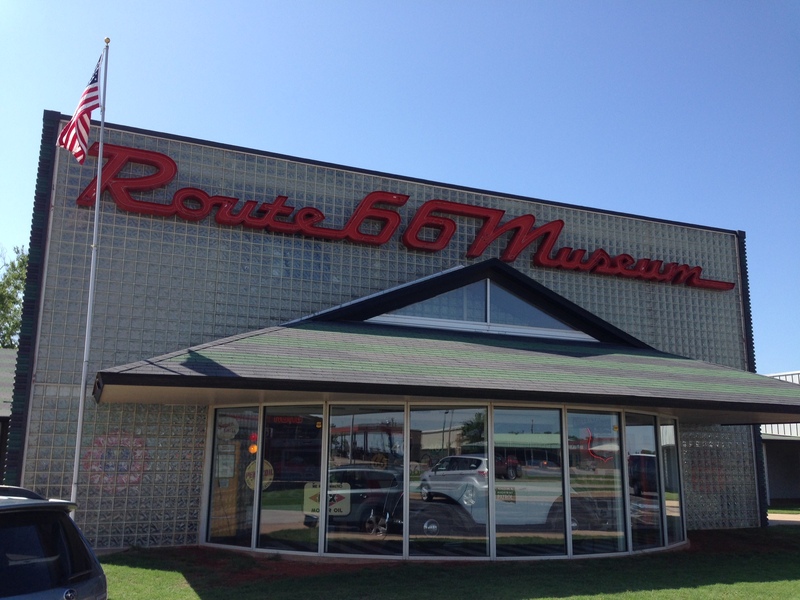 Oklahoma Route 66 Museum in Clinton, OK.
A majority of the original road is gone and many of the roadside attractions are no longer open. Some of the small towns are now boarded up ghost towns. But, there still is a lot to see and do. If the lore of Route 66 has ever pulled at you, or if you want to find some escape from our modern generic world (even in bits and pieces), I encourage you to make your travel plans soon. Route 66 awaits you and I’m not sure how long many of the places can hang on. The Cadillac Ranch outside of Amarillo, TX. 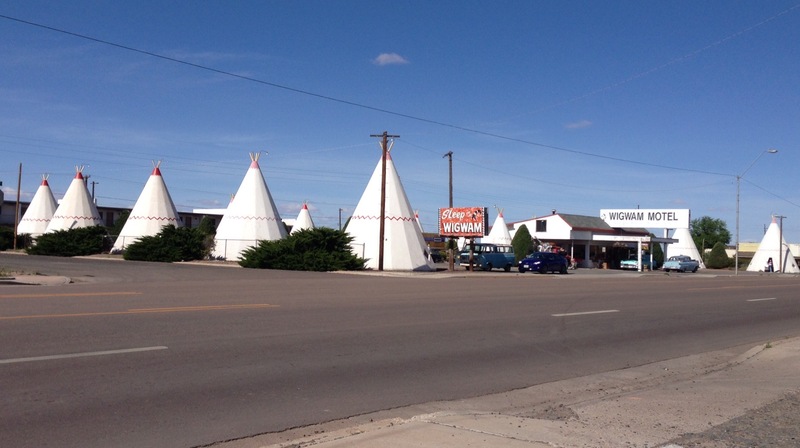 Wigwam Motel in Holbrook, AZ. Yes, we stayed here and, yes, it was awesome. 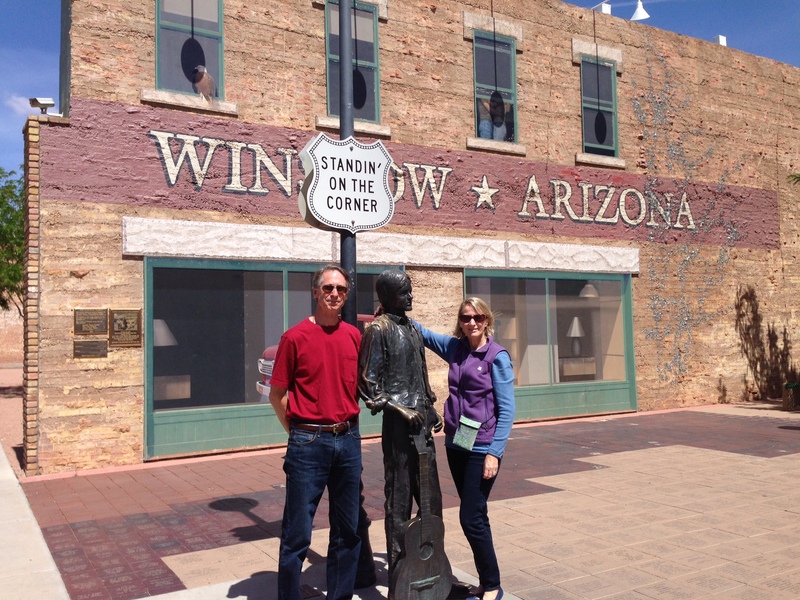 Standing on the corner in Winslow, AZ. We were a fine sight to see. * There may be hope for Generation Z as many of them would have see Pixar’s 2006 animated film Cars. In it, the once-booming Radiator Springs, situated along Route 66, is now nearly a ghost town because it was bypassed by Interstate 40. Perhaps the movie’s success has generated a resurgence of public interest in Route 66. I have many memories of traveling back and forth Route 66 from the Los Angeles area to southern Illinois during my childhood in the 1950-60’s. My parents had moved west when they got married in 1948 and we made at least 10-15 trips back and forth. I was my dad’s little navigator back when fold-up maps were all we had. We stayed at lots of different motels and ate at restaurants which I am sure are now gone or boarded up. Rest stops were very primitive – we often just pulled off the road to eat lunch. Lots of good memories. I love fold-up maps! We had a Route 66 guide book too but just a simple map to chart our journey is a must for me. Have you been back on Route 66 since you were young? I think it would be a lot of fun to see what was still there. My road trips as a child also included lunches by the side of the road. Fast food wasn’t a “thing” yet (thank goodness). Thanks for stopping by! I have not been back since I-40 took over. Sadly the few times I’ve traveled with my husband he just wanted to “get there”. Coming from CA the landscape starts out as this hot dry desert and Joshua trees, winds through mountains but still sparse, then grasslands of TX and OK. About halfway through OK, after Tulsa, the trees start to fill in. By MO the woods are thicker and it’s humid, and the ground is covered with green. I agree that the changing landscape as you travel state to state is so interesting! We also stopped at the Meteor Crater and the Jack Rabbit trading post. Sadly, we missed the others you listed. I guess they will be on our agenda next time. I have the stretch from St. Louis to Springfield, IL that I have yet to travel. One day soon I hope. It’s a GREAT road. Wow, you’ve done the rest of it then? I hope you write a post about that stretch since we missed that part. You *are* a fine sight to see! In more ways than one. This is the first time in months that WP has offered your posts in my Reader! [Grumble] Glad to see that you are enjoying the retired life to the hilt! I don’t get WP sometimes. I sign up to get certain blogs and sometimes I see them and sometimes I don’t. Anyway, I’m glad I’m finally showing up in your Reader again! Ha! Now I have that Eagles song in my head on replay. Fun to see some of the old haunts are still there, but I fear you are right. The businesses might not be able to continue in today’s regulatory business climate and fast-paced ‘bells and whistles’ expectations of entertainment 24/7. I really wonder if the whole concept of a road trip is slowly fading away. I have so many wonderful memories of driving places with my family as a little girl. I think those memories may be much richer than the ones today’s kid might have of, for instance, a Disney Cruise. Especially when their heads are buried in some electronic game. I do, too, Janis. I have learned to stop myself (usually) from being sad about it. They don’t know what they are missing, and we can’t change (so-called) progress. 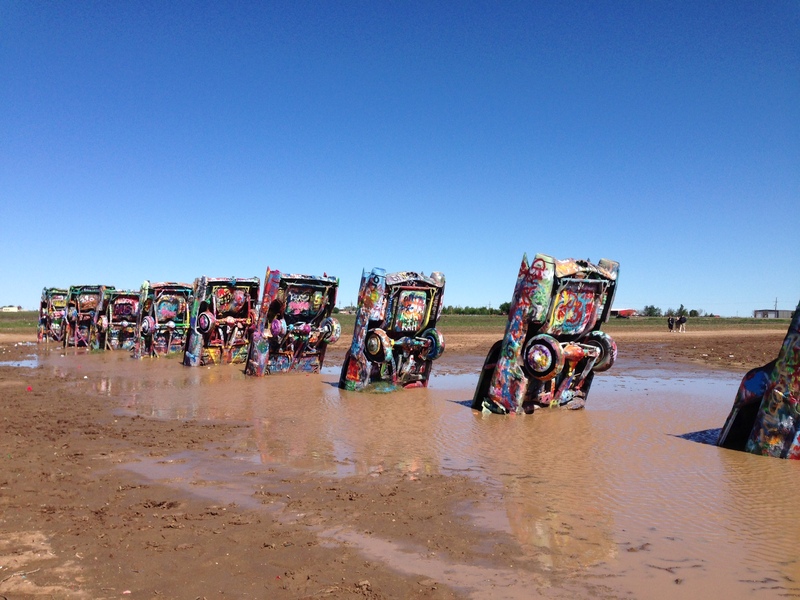 Just up the highway was the Bug Ranch which had a row of Volkswagons buried nose down and spray painted… a whimsical rift on the Cadillac Ranch. My husband and I love talking to the locals. We usually get great tips and it’s a wonderful way to “get to know” the rest of the country. These are great photos, Janis, and so interesting! I’ve never been on Route 66 and it is certainly of part of America I want to see! Thank you! We love being home but we are also planning the next adventure… there is so much to see! thank you for participating in #TheLeisureLink link-up party. This post was perfect for the link. Hope to see another again soon!! Sorry about that, was having a heck of a time commenting. I may not change my blog to WP after all. We especially like the Texas, New Mexico and Arizona portions. Road trips are the best. Road trips really are the best! It’s a great way to see the country and spend quality time with your traveling companion. My husband and I would love to spend more time in New Mexico, Arizona and Utah – such a beautiful part of the country! Sorry you were having trouble commenting. I thought my comment process was pretty simple but I’ll have to check it out and see if there is an issue. I have had problems on other sites so I know it can be frustrating. I LOVED the cadillac ranch. I suspect my contribution has been painted over by now. 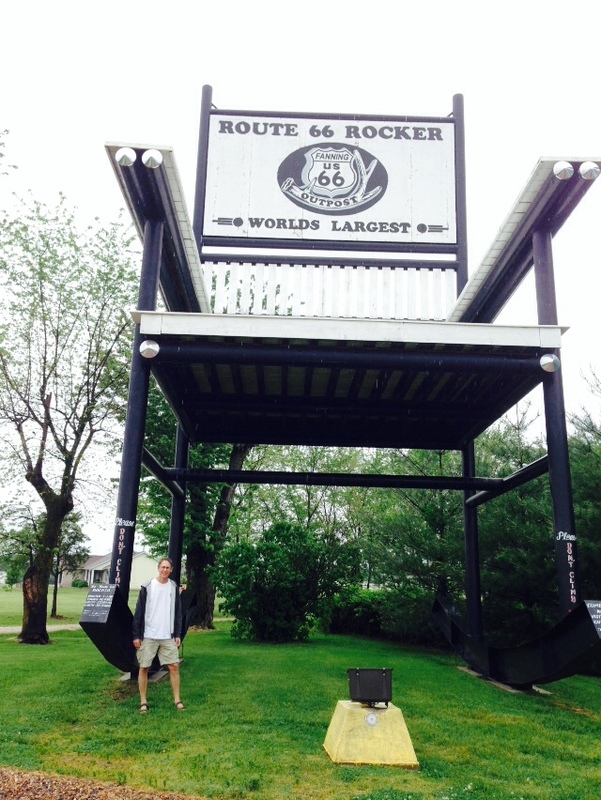 We only did a small portion of Route 66, but while there, we hit every single tourist trap we could find. Did you get to the Bug Ranch too? Just like the CR, but with Volkswagons. You are right that your contribution probably has been spray painted over multiple times, but it’s fun to “leave a little something” to mark your visit. The tourist traps are what make these types of road trips fun! Previous Previous post: Hit the road, Jack!